You've probably heard that pumpkin spice lattes are already available at Starbucks, and maybe you even know someone who already got one, and maybe even that person suggested that the lattes signify the start of autumn. Well, folks, it's still summer, and I'm not yet ready for it to be autumn. Considering that the high is still over 75° most days, I am right. If you don't want to take my word for it, autumn doesn't officially begin until late-September here in the Northern Hemisphere. Although I've continued ordering (hot) lattes at Starbucks all throughout summer, those lattes were not seasonal flavors. That's my story and I'm sticking to it. 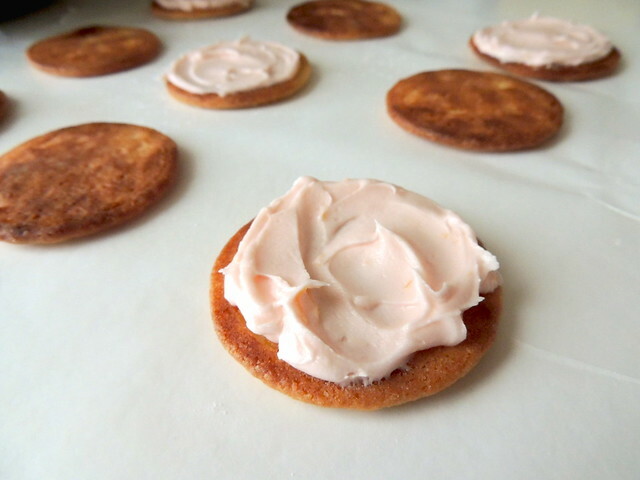 So, in defense of summer, I present you with these Pink Grapefruit Sandwich Cookies from Martha Stewart. The bright flavor is perfectly summer with a balance of sweet and tart. Although winter is the season for citrus fruits, citrus is a flavor I tend to associate with summer, such as pitchers of freshly squeezed lemonade and lime cookies with confectioners' sugar coating. This recipe have been on my radar for a while, actually, but procrastination is my number one hobby. Finally, I get to cross them off my list! 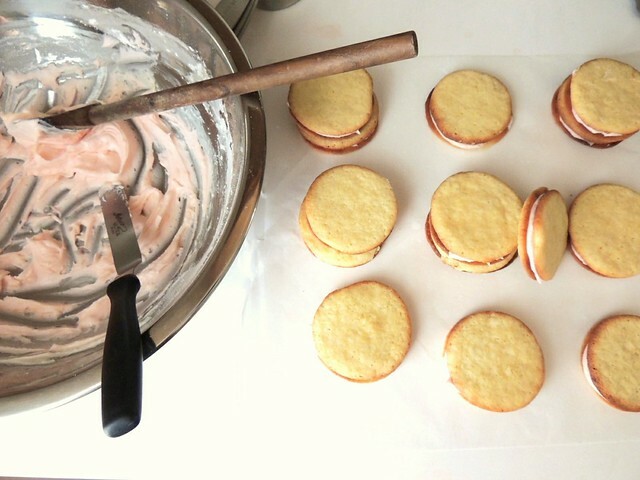 Both the cookie and the buttercream contain grapefruit juice and zest. 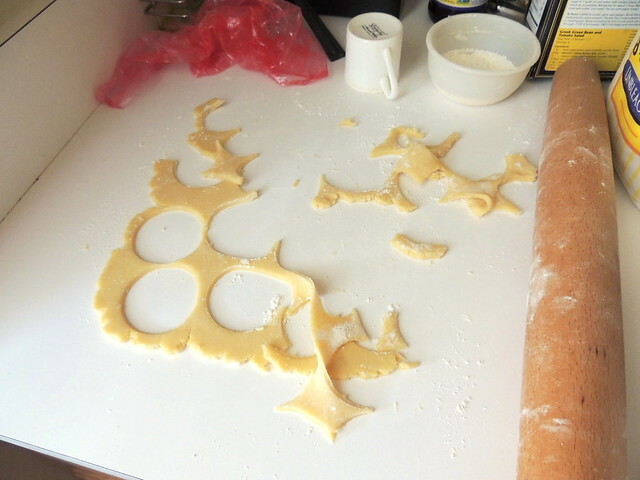 While this makes the cookie flavorful, the juice might be the reason the dough came out softer than sugar cookie dough should be, making rolling and cutting circles difficult. Despite baking the dough straight from the freezer, the cookies didn't hold shape in the oven. It also browned a little more than I would have liked, and I suspect that has to do with the oven temperature not being accurate. What would I do to remedy the soft dough? I might add more flour next time, or decrease the egg yolks from two to one. 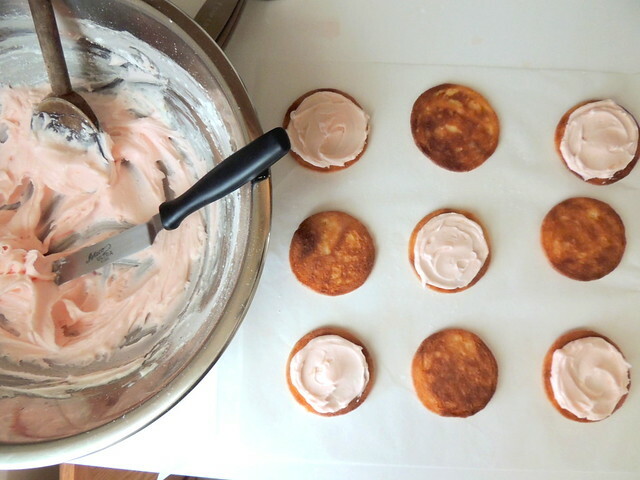 I don't want to reduce the grapefruit juice since that's what gives the cookie its flavor. Pro tip: Wax paper is useless for rolling out sticky cookie dough. Mmm, buttercream! The fresh grapefruit juice really helps cut the cloying sweetness of the confectioners' sugar-based buttercream. Tinting it pink is optional. 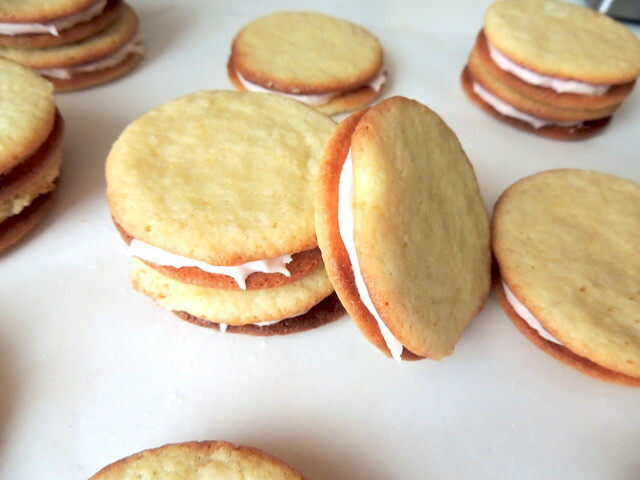 The texture of the cookies improves the longer its stored, going from crunchy to soft. Then again, maybe they're supposed to be crunchy. Not entirely sure, but either way, the cookies are delicious. I don't mean to sound Grinchy about the upcoming season. I'm looking forward to some things pumpkin, crunchy leaves in orange, red, and brown colors, crisp, cool temperatures, and apple cider. But since I don't work in advertising, I'm not going to rush it. When the time comes, I will have my celebratory pumpkin latte... If Starbucks hasn't already run out of syrup by then. Well, hello. It has certainly been a while, unfortunately. I'm not going to get into all the specifics of what lead to my hiatus (because who reads this blog, anyway? ), but, among other things, I wasn't satisfied with the direction I had taken the blog. If you noticed the increase in sponsored posts, I apologize. Although I tried to keep them relevant, I felt like I was unable to seamlessly integrate those posts to fit with the normal content. I could have worked on that and continued earning enough to pay for a few small bills, like the blog hosting, Flickr account, and cell phone bill, but the requirements rose while the profits dropped and I didn't feel like the work I would have put into it was worth it. At that point, I had begun despising blogging. The aforementioned was a small part of it; another part of it was that I felt as if the community that once drew me in seemed to have lost its path, but it was really was just me losing my way. I won't be eliminating product reviews or sponsored posts altogether, but it's not going to be nearly as often. It's just not what I want this space to be about. 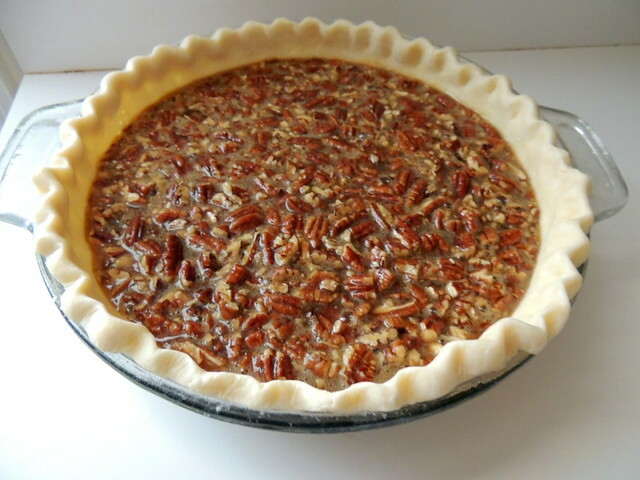 So, I offer up pie, because that is what this blog is about. 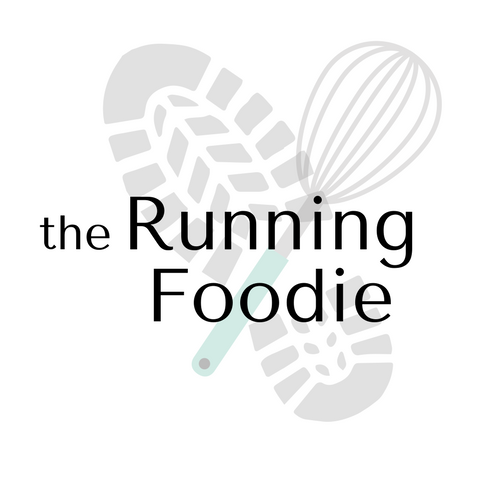 Not much of baking has been going on around here, either, making it almost impossible to find anything to blog about (I'm not even going to get into running right now.) I really do want to get back into the kitchen and bake/cook/blog more because it's a skill I enjoy developing and it's pretty much one of my biggest hobbies. I hope to utilize my subscription to Bon Appetit more than I currently do, as well. Have you heard of MasterChef? That show is also my inspiration. MasterChef is probably my favorite cooking competition show and I've always thought it would be amazing to have the skills necessary to audition. My skills aren't that refined, but maybe one day it will be. 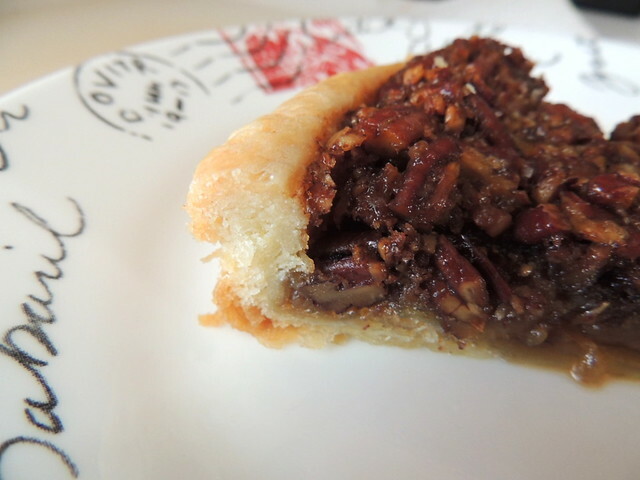 I've made this maple pecan tart around four times total, learning something new each time. The first time, I learned that I did not like the crust in the recipe; it's more of a cookie-shortbread crust than an actual pastry crust. 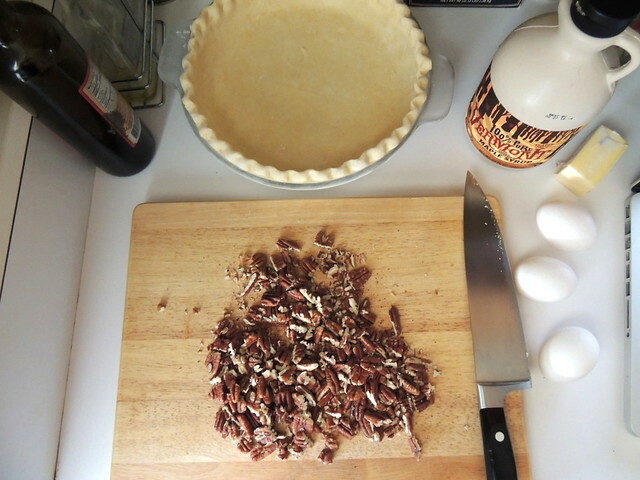 For the filling, I toasted the pecans and browned the butter, two simple changes that I felt made the pie even better than it would have been otherwise. 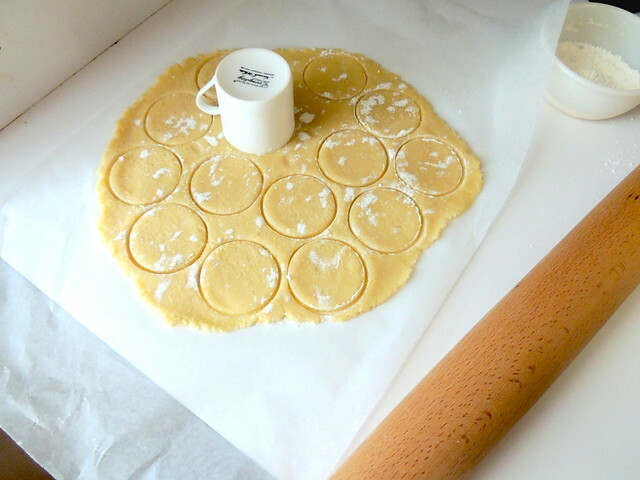 The second time, I used David Lebovtiz' tart dough that is prepared in the oven and pressed into the pan. It would have worked out well if I had doubled the recipe. As is, the bottom was too thin and the filling leaked through, causing the filling to seep through and caramelize, making the finished tart impossible to neatly serve. 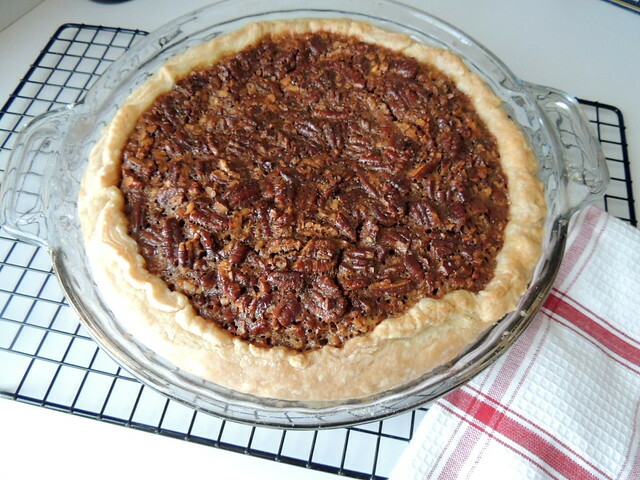 But, I used Georgia pecans a friend sent to me as a gift, so the memories of that tart are associated with good things. The third time, I made an all-butter dough using a folding technique found on Chez Pim. I LOVED this dough. It's so easy to work with, and I actually did notice a difference. I was even asked if I used puff pastry instead of pie dough, that's how flaky it was. Instead of a tart pan, I baked it in a pie dish, and there ended up being a thicker layer of sugary, eggy filling compared to the tart version. The fourth time, I baked it in a tart pan again and the crust (using the same dough) didn't thoroughly bake, since I forgot to compensate for the pan being on a baking sheet by moving the oven rack down. In this incredibly too close-up picture, you might be able to see the visible layers beginning to form. Had it been thoroughly cooked, like the edges of the crust in the first picture, this crust would have been perfect. But the filling was good. What I especially like is that it isn't too sweet given the fact that it has three different types of sweetener (brown sugar, maple syrup, dark corn syrup). It's all balanced here. 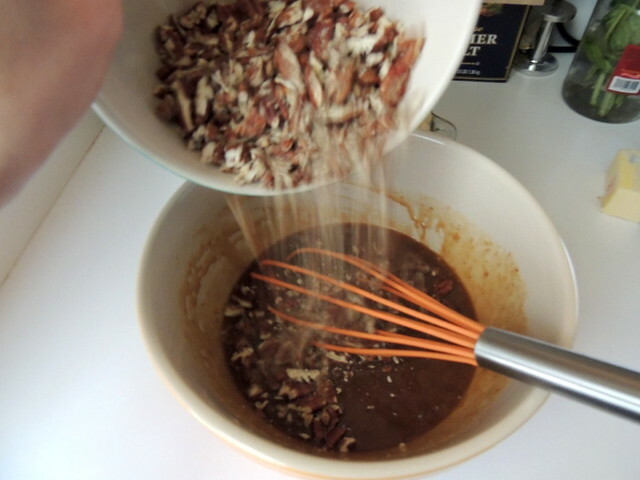 The recipe itself is incredibly consistent, and I didn't have a problem with the filling not setting after cooling. 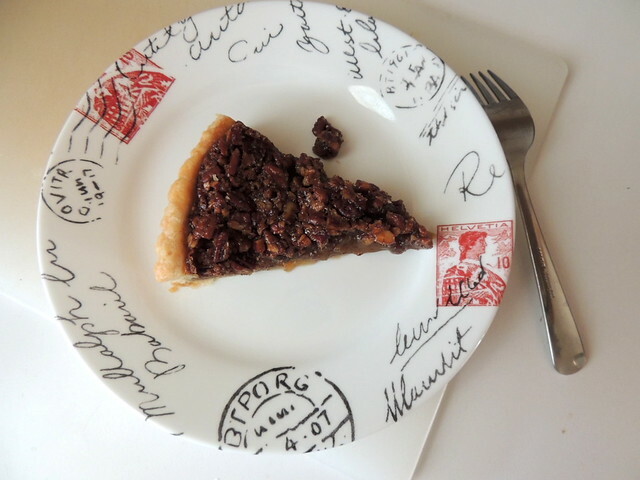 Being able to neatly slice a pie or tart is as important to me as the taste, so if a neat slice isn't possible, I feel like I missed the mark. I'm glad I finally got this pie up here. A little early for the upcoming holidays (it's really almost that time again, isn't it? Sigh...), though better early than late. For that, thanks goes out to people who prefer birthday pies over birthday cakes. And I hope to see you around here soon.